Yes, I said a Knee Cap. Your dog loves Knee Caps, doesn’t it? 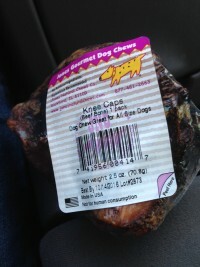 If your dog hasn’t had a Knee Cap, then perhaps you should find a store in your area that sells Jones Natural Chews and get it one! Why, you ask? I’ll give you 5 reasons Knee Caps are the all-natural rage. Remember Gentry? He’s checking out the natural goodness of the Jones Knee Cap. But do dogs like the Knee Cap? I’d have to say, based on my limited experience, that it’s not necessarily the first treat choice for a dog. Not when faced with the choice between the Knee Cap and the Pumper (a pig heart, baked like a jerky and quickly devoured), or a beef jerky treat. But the dogs I’ve given the Knee Cap to have tucked them away for later. Remember Miss Belle? And Pierre? Her mama tells me that Belle has been hiding her Knee Cap all over the house, taking it out to gnaw on it all day long. She says the Knee Cap is now white and much smaller. Good dog. This seems to play out with other dogs as well. 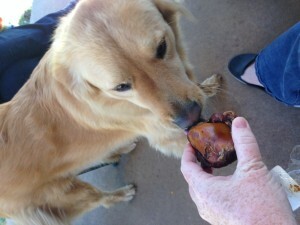 The Knee Cap is a bone, good for gnawing and teeth cleaning, not meant to be eaten as a treat in one sitting. Speaking of which, let’s run down the safety rules for treats. I run into this problem all the time with dogs. They don’t understand when I explain things to them. *sigh* Rather, they just don’t WANT to understand. I wouldn’t either if a Jones chew was on the line. So that’s the Jones Knee Cap! You know your dog wants one. My dogs want one, but I gave them all to other dogs. 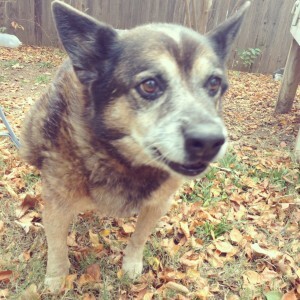 *sad face* We’re going to give one of YOUR dogs a Knee Cap, though! Just use the Rafflecopter thingy right below this to enter. Tweet daily! It works! Oh! Speaking of dogs and bones, what do you do with your bones when your dogs are no longer interested in them? PS – today’s post is gently recycled, but the giveaway is real and current. Enter now and tweet daily! !